Tasty and warming, this soup is packed with nutritious ingredients. It’s a meal in a bowl that’s perfect for chilly autumn nights. Soak the soup mix in cold water overnight, then drain and rinse well. Heat the oil in a large deep saucepan and fry the pancetta for 2-3 minutes, stirring all the time. Add the onion, carrot and celery, and continue to sauté for 4-5 minutes until starting to soften. Add the courgette, tomatoes, seasoning and 700ml cold water, together with the rinsed beans. Bring to simmering point, reduce the heat, cover, and gently simmer for 45 minutes to 1 hour, until all the vegetables are tender. Check the seasoning and stir in the basil. To make the Parmesan crisps, preheat the oven to 180°C, gas mark 4. Line a baking tray with baking parchment and heap the grated cheese in 4 rough circles. Bake for 5 minutes until the cheese has melted. Remove from the oven and allow to cool and harden. 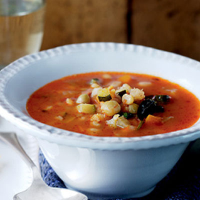 Serve the minestrone in bowls, with crusty bread and the Parmesan crisps. Traditional minestrone is made with broken spaghetti. Try adding different pasta shapes, pearl barley, or cannellini beans instead. With this soup you need a classy, dry and elegant white.